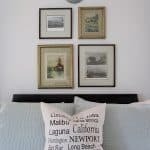 There were a few things pushed to the “back burner” after the remodel of our beach cottage. One of them was a ceiling light fixture for our living room. I wanted a casual, yet classic–(I know, had to say it) look. the wooden beads keep it casual. the flea markets (like the French commode in the corner). I also recently purchased this silver tray from West Elm. It comes in other colors and with a butler’s stand if you wish. away in San Diego. But I just learned they are building one near us. Trouble. The prices are reasonable though. 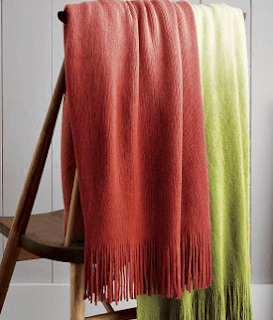 Notice the new “dip-dyed” throw blanket also from West Elm? It’s on sale right now, super soft and comes in two colors. See you tomorrow with the new chandelier and other updates with Raoul fabric. gorgeous room! I love all your elements and that chandelier is dreamy! You are so fabulous! Adore the new chandy! Cannot wait to see it in its new home. Looks nice, Mary Ann. Can't wait to see it installed. What a beautiful place. Love your house, Mary Ann. It just keeps getting better and better. I LOVE this chandelier! Can't wait to see it up!! The chandelier is a great choice. 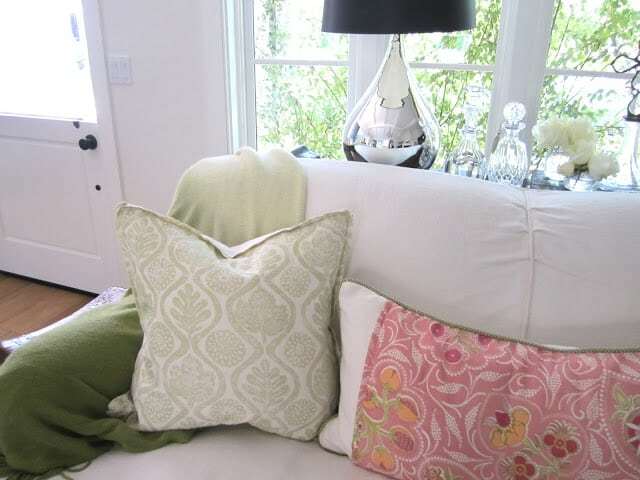 Your floral pillows add so much life to the room. 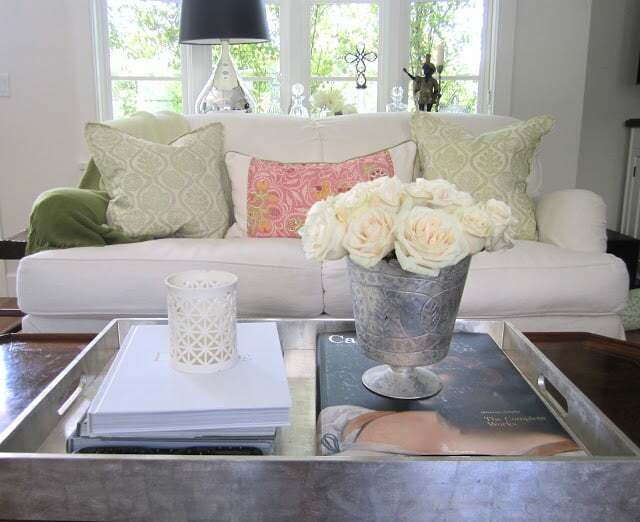 Love the tray and pedestal vase for flowers. Your living room is so pretty, the beautiful dark commode complements the white slipcovers. 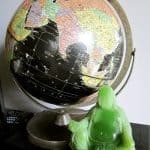 AMAZING POST:) I really like your blog and I now follow you on FB, do you have twitter?? Hi,graet choice I love your living room so nice and beautiful and I love your home so much! 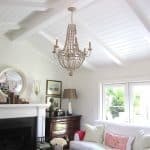 Your living room really is casual yet classic and I think your new chandelier is perfect for the space. LOVE the silver tray aswell! 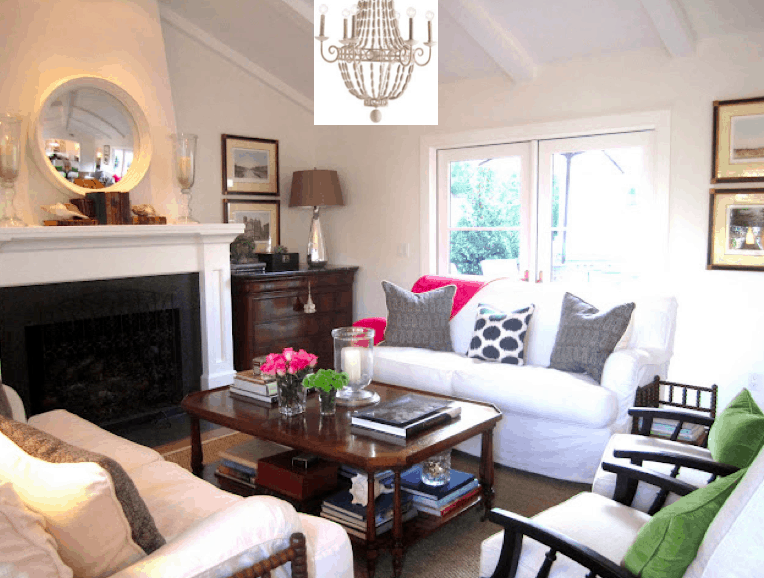 Your chandelier is so pretty (as is the room)….I can't wait to see it up! It's gorgeous, the perfect combo of bling and rustic!! The tray looks beautiful, too! This is a wonderful room…very bright and inviting! I'm looking forward to seeing the chandelier! The light fixture is PERFECT!! Great choice cannot wait to see it up and hung! I love WE, frequent there often! Tell me how often you have to clean your white slip covers…am thinking, but am lazy! 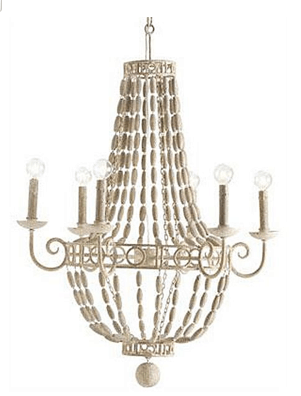 I LOVE this light fixture…it is gonna look fabulous in your gorgeous room. I absolutely love your beautiful home Your new light fitting is fabulous. I have been considering that Arterior chandelier for some time now, so I look forward to seeing how it looks in your space. Love the West Elm tray as well. I really like the chandelier. It's perfect for your room, lends some style yet the wood tones down the formality. 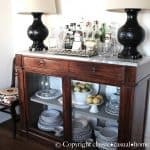 I only recently started shopping west elm, I had heard about it but never bothered to check it out until our adult son and his fiance started sharing that they were considering various items for their new house from WE. The tray almost looks like zinc, very nice. very lovely, warm but also fresh and clean looking. I hate to be repetitive, but wow! It will be something to see how one addition will have a huge impact! GREAT tray, too! 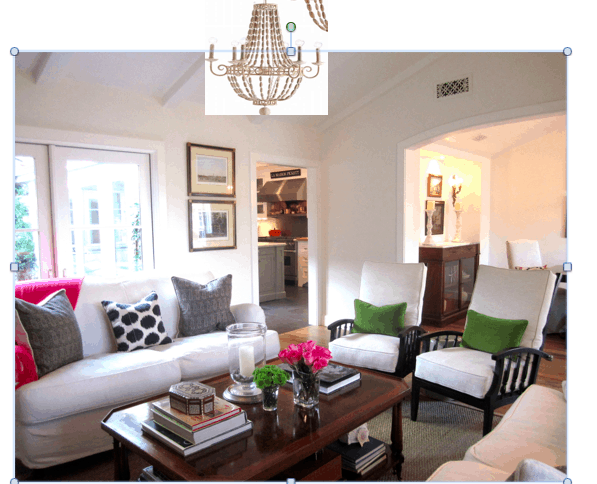 Mary Ann….I just love your new chandelier and can't wait to see it hung in your beautiful living room. It's perfect! LOVE the new W.E. tray….would love one for my coffee table too! Can't decide…silver or gold? And your new spring pillows are gorgeous. That's what's so great about having all your upholstered pieces neutral. Mmmmm…..love it! Love the chandelier, and of course the white walls !! What a great chandelier! Couldn't look more perfect for your space…enjoy! What a lovely, comfortable room! 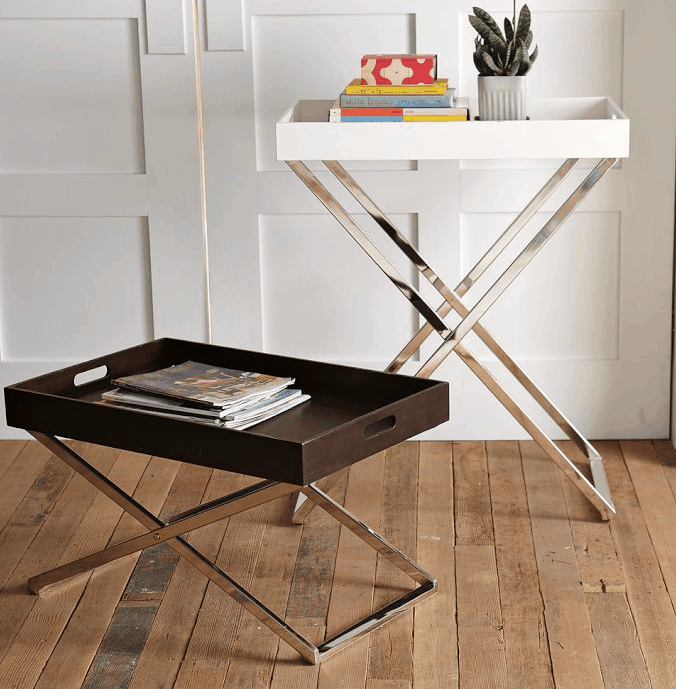 Love the West Elm trays and stands. That chandelier is perfect for your living room. And I may have already mentioned this, but that's a great new profile photo of you too!